You want to spend time with your child. You know you should spend time with your child. But who has the time? What, exactly, do you do with a preschooler? Teach Me Mommy, now in its third edition, gives you basically everything you need to develop a loving, learning environment for your child in a home-based preschool. Teach Me Mommy has helped tens of thousands of parents and their preschoolers to enjoy easy, educational, and fun quality time together, and it can help you too! Jill Dunford, the author, is the mother of seven children (five boys and two girls). 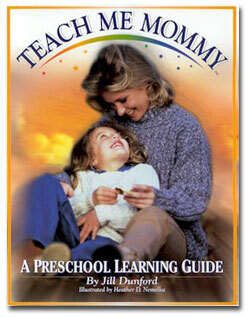 Jill began Teach Me Mommy when her oldest son was four and they were living in a small town in Michigan. After discovering that the preschool programs in her community were not what she wanted for her children, she began a program of her own. Over the course of 10 years (and six more children), Jill refined this home-centered approach, emphasizing experiences that instill a desire and an excitement for learning. After writing an article about her home preschool activities for a national, special interest magazine, Jill received calls and letters from all over the country asking for more information. The response was amazing! Many asked for a manual or a how-to book, so that they could learn how to have preschool activities at home for their own children, too. So Jill wrote Teach Me Mommy, published in 1982. Updates and additional material have followed, resulting in the valuable book that is available now. Jill is the mother of seven children (five boys and two girls). She has both Bachelors and Masters Degrees in English, and is presently a high school English teacher in Grayson, Georgia. While we’re very happy about the thousands of families that have benefited from the lessons and activities in Teach Me Mommy and hope still more will order this great preschool resource, we wanted to help even more parents with ideas and activities. Thus this website was born. Simply put, TeachMeMommy.com is a place to share preschool activities, games, learning ideas, and teaching tips to help young children learn and grow. Well, right now, it’s Jill Dunford, her daughter Brittany Weiler, and her daughter-in-law Wendi Dunford. But we’re hoping more of you join in! So please, drop us a line and let us know what you’re doing to make your life easier and the lives of your preschoolers great.